It is a simple thing – He writes season’s greetings as Merry CHRISTmas. In a subtle way folks receive a nudge to keep Christ in Christmas. Advent is a nudge to all of the reason for the season, of Christ’s coming – past, present and future. It is a celebration of the Christ child’s birth and the expectation of His second coming. In the present, Christians celebrate the coming of Jesus the Christ individually through the indwelling of the Holy Spirit. Advent, starting four Sundays before Christmas, is one of my favorite seasons in the Church. 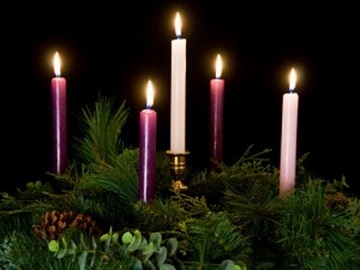 As another year passes by, the five candles that make up the Advent wreath help provide perspective. The first Sunday’s candle helps all focus on the HOPE that is Jesus’ second coming; the second candle represents the FAITH Christians have in the miracle birth of the Lord Jesus in Bethlehem; the third candle rekindles the JOY the shepherds experienced when they heard the angels sing on high; the fourth candle is a reminder of the PEACE introduced to the world through the Prince of Peace; and the fifth candle, lit on Christmas eve, is the Christ candle which is the Light Christians are to reflect in every discussion, decision and relationship faced in this life. A voice of one calling: “In the wilderness prepare the way for the Lord; make straight in the desert a highway for our God. Every valley shall be raised up, every mountain and hill made low; the rough ground shall become level, the rugged places a plain. And the glory of the Lord will be revealed.” – Isaiah 40:3-5. This passage is a wake-up call in the wilderness that is this noisy world today. I am convicted of the mountains and valleys that have impeded my walk with the Lord. The mountains include status, self-importance and a drive to be successful in my strength. Valleys include sin in my life, wrong priorities and what I have undervalued - physical presence, emotional engagement and spiritual leadership in family. With an identity grounded in my accomplishments instead of in the Lord, in who I am versus Whose I am, the highway for our God is made anything but straight. Advent is a call to lead by example by leveling mountains and filling in valleys that can distract from right priorities – to prepare a way for the Lord for those following us. Participate in a family service project or ask the kids to donate some of their toys or clothes to a women’s shelter, Goodwill or a charity of your choice. Prayer guide: Father, thank You for Your word and Your call to lead by the example You set for us. Too often I have let my identity be defined by who I am instead of Whose I am, in my way instead of Your Way. Forgive me. Grant me clarity and strength to level the mountains and fill in the valleys of my life to make straight in the desert a highway for You. Help me lead by example for my family and others You bring into my path over this CHRISTmas season. Amen. A faithful father keeps CHRIST in Christmas as he leads spiritually by example in family. Another 'winner' Rick! You've touched me deeply with your words, with our Lord's words.